Bilbao is a great example of the wholesale transformation of the former industrial city – not just physically, but socially, economically and culturally. The rejuvenation it has achieved over the past 30 years is nothing short of remarkable. Equally the obvious care and attention to citizen engagement, inclusion and equality in that transformation process is both commendable and inspirational. Bilbao has been fortunate in benefitting from the considerable fiscal freedoms the Basque Country has been afforded, including municipal-level powers to raise/levy/collect taxes. But it has used these freedoms with considerable prudence, demonstrating considerable skills and expertise in managing its finances and administration. It has been debt-free since 2010 – despite being impacted heavily by the 2008 global financial crisis – and has intelligently used public-private partnerships for over 30 years to corrall stakeholders into a single set of shared objectives and lever in private investment. It also has an exemplary record in transparency and accountability to citizens – amply illustrated by the recent independent assessment of 89 per cent support from citizens. It is no coincidence that the city won World City Prize of the Year in 2010. Bilbao has prioritised the creation of a greener, high quality living environment for all citizens to promote social and community cohesion, equality and participation. Its public transportation system is excellently planned, designed, operated and maintained; public spaces are appropriately designed for their location, with excellent children’s play spaces in particular; and it has intelligently included provision for vertical as well as horizontal mobility and accessibility. It has also used these interventions to implement extensive climate change resilience measures, and to integrate sport and culture as key facilitating tools. The city had a long tradition of effective and visionary leadership, dating back to the brave decision in the mid-1990s to invest 96m Euros in the Guggenheim Museum at a time when the city was economically and socially at its nadir. The current mayor has taken on the mantel created by his longstanding predecessor, who had led the city from 1999-2014 (being awarded ‘World Mayor of the Year’ in 2012), but the approach is the same: to work collaboratively, pragmatically and intelligently for collective benefit, and to learn from best practice elsewhere. Municipal politicians of a wide range of ages were uniformly impressive in their understanding of the city’s challenges and the responses; and professionalism, openness and transparency. The city’s achievements to date were ample demonstration of their considerable competence in translating this commitment into delivery. Basque society promotes a strong commitment to collective responsibility, openness and self-sufficiency. The mantra of all policies, strategies actions being ultimately towards the betterment of the quality of life of all citizens was absolutely resounding: the city’s awareness of and intervention for an ageing demographic was one of many impressive facets to this. This ethos had been augmented by a move to co-creation through initiatives such as participatory budgeting. The obvious common stewardship of public infrastructure was one illustration of the city’s success in creating a shared sense of civic pride. Bilbao was founded in the 14th century in a steep valley on the estuary of the River Nervion, enclosed by the foothills of the Cantabrian Mountains. Despite being 14km from the Bay of Biscay, the deep and wide river provided exceptional navigability for large ocean-going ships and protection from the wild Atlantic weather. The city quickly became the commercial and mercantile hub of the north of Spain. This was aided by the discovery of plentiful, easily-mined high quality iron ore, which led to the development of major iron foundries. Bilbao is the largest city in the autonomous Basque Country and the north west of Spain. It is the fifth largest metropolitan region in Spain, with just under one million inhabitants. Confined into a morphological bowl in the valley floor, the city itself only has 345,000 residents. 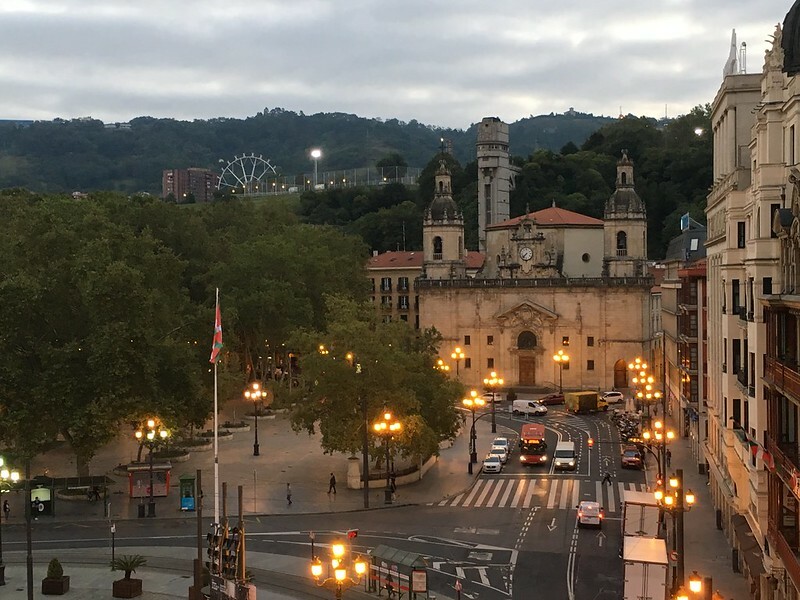 As a trading port Bilbao has always been a city of migration: the city hosts 127 nationalities, and over 60 per cent of the first and second generations of the population were born in other parts of Spain or overseas. By the 19th century Bilbao was the second-most industrialised region of Spain, behind Barcelona. Over 60 per cent of the city’s GDP was generated by industrial uses, including shipbuilding and machinery and tool production. Mercantile activities, notably banking, were also still important economic drivers. From 1900-1980 the population grew more than five-fold to over 430,000, giving rise to a chaotic environment, with disease and overcrowding in the mediaeval city centre. New neighbourhoods were rapidly constructed on the outskirts of the city; illegal self-built communities appeared on the city’s green hillsides – the consequences of which the city is still dealing with. The Spanish Civil War started in Bilbao and civil unrest grew; however, the city’s industriousness was important to Franco and it was treated relatively leniently by his regime. Continued disaffection under Franco led to the birth of the Basque nationalist group ETA in 1959. The seismic global redistribution of industry in the 1980s hit the city very hard and very suddenly, compounded by increasingly violent and disruptive ETA activities. Unemployment peaked at just over 30 per cent. Drugs and alcoholism became major problems. 25 per cent of the population left the city. A catastrophic flood during the city’s annual Aste Nagusio fiesta in August 1983 left the city 10ft under intensely toxic river water – the Nervion being so polluted and deoxygenated it was almost officially a ‘dead river’. Bilbao was forced to rethink its very economic foundations. Using Basque cultural pillars of a powerful yet pragmatic sense of shared identity and self-reliance, it chose not to adopt a tabula rasa – a blank slate – approach. Instead they decided to preserve the most profitable and technologically enabled elements of their former industrial base, and to use its existing strong mercantile tradition to catalyse a vigorous more service-based economy. But the city realised that they could not do this in an environment that was so polluted and uninviting. For so long the literal and metaphorical backbone of the city, the River Nervion and its industrial shoreline was the city’s first key focus: £1.2bn has been invested to date in cleaning the watercourse and adjacent lands, and making sites available for higher-value uses. A huge programme of improved architecture and urban design of the urban fabric was implemented in the rest of the city – a process which is still ongoing – to make a step-change in the quality of living environment for residents and visitors. Unattractive infrastructure barriers such as extensive at-grade railways have been buried underground to enable neighbourhoods to be reconnected, with new public transportation, green spaces and community facilities built at grade above. Prudent use of ‘starchitects’ and clever re-use of historic buildings has created a distinct and attractive mix of built-fabric. 37 per cent of the land within the city boundaries was now protected greenspace. Resilience to climate change was also key: this had been incorporated into this investment too, for example by reforestation and storm water capture infrastructure, plus planned new neighbourhoods such as Zorrotzaurre. The city also took some very brave decisions. Perhaps the biggest of these was to invest 96m Euros on securing the Guggenheim Museum in 1997, when the city was still at its economic and social nadir. The risk has paid off, as the Guggenheim has since become an icon of the city’s rebirth and put it on the global map, as well as triggering a tourism industry now worth over 300m Euros of city GDP. That said, the city is clear that the Guggenheim was not the sole reason for the city’s rebirth, but more an anchor for ‘Transformation Phase 1’ and a catalyst for later stages. A less recognised but critical factor in Bilbao’s successful transformation has been political stability and excellent leadership. This has been in spite of the turmoil of the Franco and ETA eras. The Basque Nationalist party has controlled the city since 1980, often in collation. This has promoted government by consensus, with a pragmatic rather than ideological approach that is focused on partnership and delivery. This shows through in the way the city has dealt with the fiscal freedoms it enjoys as part of the Basque Country, whereby it can set its own taxes, levies incentives, etc. and has the stability of paying the state a fixed per centage amount of annual revenue income (6.24 per cent presently) for national services such as security and defence. The city has used these powers wisely, for example levying extra taxes to fund major infrastructure improvements such as the fantastic public transport system, new parks and public spaces, cultural and leisure facilities. These were often unpopular at the time, but the fact that Bilbao’s citizens know that they themselves have almost 100 per cent funded this investment over the past 30 years clearly has imbued a sense of ownership and collective stewardship. Even more importantly it means that since 2010 the city has been debt-free, despite being hit hard by the 2008 global economic crisis. It even has 100m Euros of savings it is struggling to access due to peculiarities of national government regulations. Basque societal attributes have also played a part. Officially one of the safest cities in Europe, it is outstandingly warm and welcoming, with a palpable sense of ‘civic pride’. It is a society where poverty and exclusion is not seen as the fault of the individual, but of society as a whole, and where everyone works together for the collective good – as its GINI coefficient (a measurement of equality) illustrates, which is one of the lowest in the OECD. Every policy, strategy and intervention is ultimately driven by the desire to create a better city for everyone equally, with transparency and accountability of the municipality a core principle. 25 per cent of GDP is spent of social services, including provision of a ‘guaranteed minimum income’ for everyone (the only region in Spain to offer this). 50 per cent of all housing development by law has to be affordable social housing. Gastronomy, sport and arts and culture are all used creatively and intelligently as tools to ensure social inclusion, cohesion and equality; a participatory budgeting system is now in place. The excellence of city administration has been recognised globally, for example by the Lee Yew Kuan ‘World City’ award (2010), ‘Mayor of the Year’ (2012), and ‘most transparent city in Spain’ every consecutive year since 2008. But the biggest testament to civic trust is a recent independent survey that showed 89 per cent resident satisfaction with the municipality – and the fact that the city was more focused on positively changing the remaining 11 per cent! A major current challenge for the city is that its population is shrinking by 2.2 per cent per annum, which is due to an ageing demographic (almost a quarter of the population are over 65) and low birth rates. The city realises that current immigration rates of 10-12 per cent per annum will not halt population decline, and are proactively seeking to address this – for example by putting in place incentives to retain and attract young professionals. Special programmes are also in place to ensure the city’s older demographic remain an active contributor to society, for example, by providing free escalators and lifts in hillier neighbourhoods and in apartment blocks. The attitude that this ageing demography was as much an opportunity as a challenge was refreshing. Housing also remains an acute challenge: demand outstrips supply as household unit sizes fall, and more remote declining estates built in the post-war period fall out of favour. The process of economic transformation is also on going. It has achieved much since the nadir of the mid-1980s: services represent 62 per cent of GDP, with the 27 per cent of industry contribution to GDP being driven by advanced industrial services and manufacturing, bio and environmental technologies, and digital. GDP per capita is 40 per cent above the Spanish national average, and double the level it was in 1996. Productivity is 28 per cent above EU average. The city aims by 2035 to be one of the top five mid-sized European cities in terms of metrics on employment, GDP, education, health and wellbeing. But the city still has challenges that it is actively tackling. For example whilst unemployment at 16.9 per cent is below the national average of 17.6 per cent, it is still well above pre-2008 levels (seven per cent). In addition, despite over 60 per cent of the population having tertiary qualifications (degree level or above), there are record-high unemployment rates amongst graduates – indicating a mismatch between the available skills-pool and skills required. There is an entrenched nine per cent of long-term unemployed, many without qualifications. The city is open that it has a long way still to go, and is proactively developing partnerships with local higher educational institutions and private businesses, and looking to learn from best practice and lessons learned in other cities.